The United States Mint released the much anticipated 2009 Lincoln Cent Birthplace coin on February 12, 2009 in Hodgenville, Kentucky. Hodgenville is near the birthplace of Abraham Lincoln which occurred exactly 200 years earlier, making this year as the bicentennial of his birth. This redesigned coin is the first in a series of four authorized as part of the Presidential $1 Coin Act of 2005 (Public Law 109-145). 2009 also marks two significant occasions in the history of the Lincoln cent. The United States first minted a version of it in 1909, then the centennial of Abraham Lincoln's birth. It featured a reverse with two sheaves of wheat flanking the words "ONE CENT" and "UNITED STATES OF AMERICA". Commonly known as the "wheat penny", it was replaced in 1959 to celebrate Abraham Lincoln's 150th birthday. This 1959 version had a reverse showing the Lincoln Memorial designed by Frank Gasparro. It also included the words "ONE CENT", "UNITED STATES OF AMERICA" and "E PLURIBUS UNUM". One consistency between the previous two versions and the new 2009 redesigned ones is the portrait on the obverse side. It features Lincoln facing to the right and was designed by Victor D. Brenner. Born in a log cabin in Kentucky, this new coin is meant to signify the humble beginnings experienced by the 16th President of the United States. As President, he would lead the country through the Civil War, and would die from an assassin's bullet only a few days after the end of the war. A version with the same metallic content (95% copper, 5% tin and zinc) as the original 1909 Lincoln cent will be available later from the United States Mint for collectors. They may also be interested in the Lincoln Silver Dollar Proof or Lincoln Silver Dollar Uncirculated version, which also were released in 2009 to celebrate the bicentennial. Sales of two-roll sets of circulating Birthplace 2009 Lincoln Cents were announced by the United States Mint on Friday March 24, 2009. The 100,000 limited supply sold out in less than two week as a result of huge collector demand, helped by the inability to find the pennies in circulation throughout much of the country.. For more information, see Lincoln Coins Sold Out on CoinNews.net. 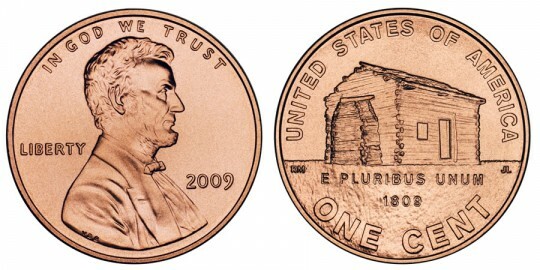 Information on the new cent coin to be issued in 2010 and subsequent years can be found on the 2010 Lincoln Cent page. The obverse design remains as it has for 100 years, and shows a portrait of Abraham Lincoln facing right. It was designed by Victor D. Brenner. It includes the words "IN GOD WE TRUST", "LIBERTY", "2009", and if minted in Denver, the mintmark "D". A log cabin takes center stage on the reverse of this coin. It is meant to portray the cabin where Lincoln was born near Hodgenville, Kentucky. Also seen are the words "UNITED STATES OF AMERICA", "ONE CENT", "E PLURIBUS UNUM", and "1809". It was designed by Richard Masters and sculpted by Jim Licaretz.